Custom temporary tattoos are a fun and appealing way to get your brand or message seen. If applied during the event they create a sense of community among the participants, and if taken home as a giveaway you create future ambassadors. Our four colour printing process allows you to turn virtually any design into a temporary tattoo. This product provides great bang for your buck. Perfect for special events, concerts, product promos and inserts, trade shows, sporting events and kids’ giveaways. Design a bold, unique or surprising temporary tattoo and you may be amazed how many people will want one! For quicker, easier application during events consider our waterless tattoos. 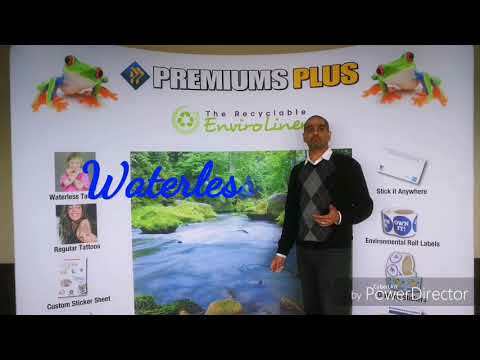 A Premiums Plus exclusive product, our waterless tattoos are also one of our best sellers. Selected product is not available at this moment. Our virtual sample designer allows you to create virtual samples that you can email directly to your customer with the option of adding you own logo. Imprint Options: Allow 0.25” space between multiple images on tattoos and .1875” from edge of tattoo. Waterless tattoos are manufactured using only non-toxic, FDA certified inks. Tattoos are not printed with conventional inks, therefore slight colour variations may occur; Call for more Details. No bleeds or PMS match available for this product. Product Notes: Individually sheeted and stacked in bundles of 125’s. Rush Service Available:Yes (+20%) Copy change or Custom back (must be in multiples of 500); $65 (G)"
What are Waterless tattoos, this video explains what Waterless Tattoos are and the benefits. we are the only manufacturer of Waterless Tattoos in the world. No water? No problem! Mess-free, instant application = on the spot branding! Stay up to date on the latest sales, news and campaign ideas with the Premiums Plus newsletter. © 2019 Premiums Plus. All rights reserved.